Powerful and fantastically moving, Abha Qatar flew the flag for his proud owner Al Osooal Stud at the Prince Sultan Arabian Horse Festival. Sired by Marwan Al Shaqab and out of ZT Ludjkalba, by Ali Jamaal and El Shaklan, Abha Qatar combines best genes in shiny chestnut. Already an accomplished show horse, winning 2013 All Nations Cup Gold Champion Senior Stallion and 2016 Prince Sultan Arabian Horse Festival Silver Champion Senior Stallion the fiery eleven years old Abha Qatar, bred by Ganaderia Ses Planes, Spain, came back to the show ring to compete for gold. And he succeeded, with 92 points, the highest mark of all males, Abha Qatar won his age class and later was awarded Gold Champion Senior Stallion. Silver was awarded to the Al Batran son Al Khatab Al Thani with WH York, by Marwan Al Shaqab winning Bronze. The Senior Mare Championship was a parade of beauties. An exciting crowd filled the grandstand to have a glimpse of the candidates like Bint Hazy Al Khalediah, Donna Molta Bella SRA, Norma, and Shirin By Aisha; all had won her class. In the end, the bay Donna Molta Bella SRA was one step ahead and was awarded Gold Champion Senior Mare. Another motion artist by DA Valentino out of RD Fabreanna, by Falcon BHF, bred by Dan and Maureen Grossman, USA, and proudly owned by Al Saqran Stud. A fleabitten and bold moving beauty garnered Silver, Shirin By Aisha, with the elegant Bint Hazy Al Kahlediah winning Bronze. Earning the coveted title of Gold Champion Junior Colt was the EKS Alihandro son Gabel Athbah out of Meqbilat Athbah, by QR Marc so linebred to Marwan Al Shaqab and proudly bred and owned by Athbah Stud. Next was Silver winner Madagascar J, by Excalibur EA, bred in Belgium but owned by Al Osool Stud. Mishaal AM, an Abha Qatar son, garnered Bronze for Al Mohamadia Stud. Well presented by Rod Jones, Venice MI, by Allegiance MI received 92,60 points in her Fillies 3 years old A class and easily won the blue ribbon. Back in the Junior Filly Championship Venice MI, out of Valentine MI, by DA Valentino, convinced the judge's team again and was awarded Gold Champion Junior Filly much to the delight of her breeders, the Farell family, USA, and her proud owner Al Muawd Stud. Silver was awarded to the 2017 Gold winner, Mayar IV, by Kanz Albidayer, and Bronze was given to the Kahil Al Shaqab daughter Haifa ED. What about the youngest generation of show horses, the yearlings? It was the Emerald J son Admiraal out of Haniyyah, who made his owner Al Muawd Stud proud. His dam is one of the valuable Psytadel daughters, which produce so well with the Marwan Al Shaqab sire line. Al Muawd Stud also bred the Silver Champion Yearling Colt, Dinar Al Muawd, again sired by Emerald J, but Naif Fahad Abdulla Al Ouidah owns this colt. Bronze was given to Maher Al Sayed, by Alexxanderr. Alexxander also sired the Gold Champion Yearling Filly, Teejan Al Muawd, and her proud breeder Al Muawd Stud accepted the award. Teejan’s dam is ADH Just Divine, by champion maker WH Justice, so this filly is linebred to WH Justice through her sire and dam. The Silver Champion Yearling Filly SN Roz, by Qais, is bred and owned by Talib Nasser Bin Mohammed Al Mustaner. Receiving the title of Bronze Champion Yearling Filly was another Alexxanderr daughter, Hala Al Sayed, bred and owned by Al Sayed Stud. 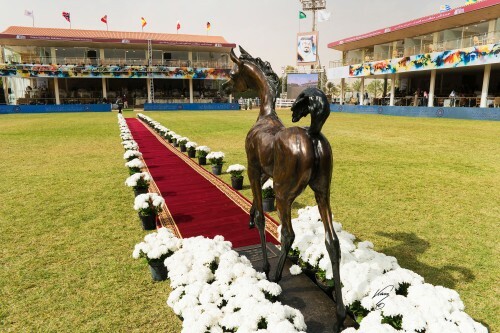 As in the years previous, the 2018 Prince Sultan Arabian Horse Festival was an amazing celebration of the Arabian horse and – thanks to a vision of His Royal Highness, Prince Khaled bin Sultan bin Abdulaziz Al Saud - has been implemented to promote and develop the equestrian disciplines in which this extraordinary animal competes. The Arabian horse has played a vital role in the history and development of the Arabian culture and is held in high regard by all who chose to become part of this amazing animal´s equestrian world. 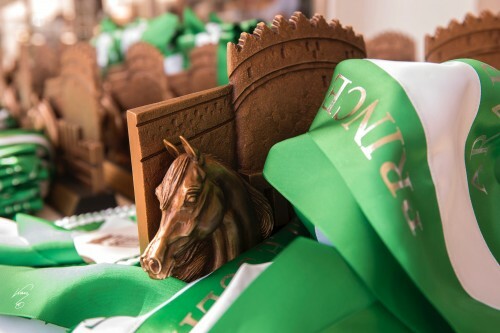 We wish to thank the organizers for partnering with Arabian Horse Results. It is an honour to cover such a prestigious event.